Brendan and I finally agree on something. As he and I continue to spar over the comparative merits of the new Mumford and Sons album, Babel, Busse its the nail on the head in his last essay (see also my review, which started the exchange). 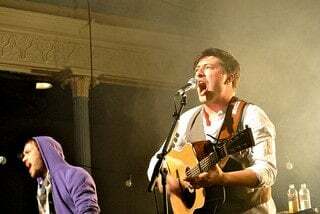 The task of Marcus Mumford is to give us signs of faith, hope, and love that we can never forget. And M&S do that – Marcus’s voice invites us to share in his piercing sentiments of the same. Brendan quotes some lovely lyrics from “Broken Crown” that capture the urgency of making hope out of hopelessness. Crawl on my belly until the sun goes down. I’ll never wear your broken crown. I took the road and I f**ked it all away. Now in this twilight, how dare you speak of grace? You see, I’ve never crawled ‘till the sunset or worn shiny, broken headgear. I have seen a husband leave a wife. And in that moment, I can see with heartbreaking clarity exactly what it is for a creature to cry out in hopelessness. Mumford’s sentiments might evoke some vague yet powerful sense of being lost. But the look of the a speechless child clinging tight to the denim-clad leg of heartbroken mom? That’s what hopelessness looks like. Bruce takes the sentiments that Marcus draws from our hearts and connects them in the sights and sounds of real life. He ties earnestness to experience, sentimentality to substance. And because of this, his lyrics acquire a power that Mumford’s cannot. (Just listen to Jon Stewart tell the President how The Boss can redeem our whole lives by tying our experiences to sentiments that Marcus expresses clearly. I’m not embarrassed at all to say this made me cry).